This Scrub Live Oak was found in the Seven Spring Recreational Area, Maricopa Co., Superstition Mountains, Arizona. Formica ants are a regular denzen of scrub oak foliage by day. SHRUB: Typically grows to a large shrub with several to many principal stems but can also grow as a small tree. Sometimes called Shrub Live Oak. 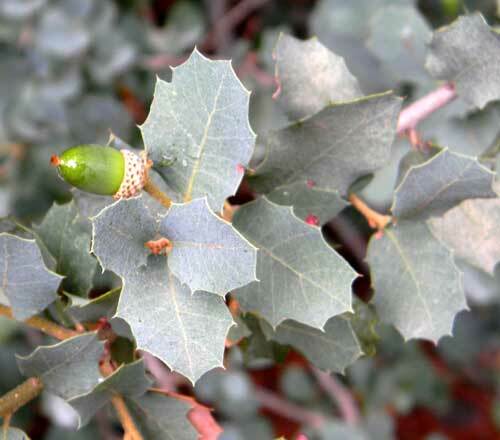 LEAVES: The dull, evergreen leaves are usually smaller than other oak species and the leaf perimeters are toothed and sharply mucronate (spiny). The leaves have a dull, scruffy cast. RANGE: An important component of interior chaparral in Arizona, but also frequently growing on drier spots within sycamore woodlands. In this habitat scrub live oak may achieve tree-size. FRUIT: Acorns. The cup shells are smooth inside, not tomentose (fuzzy). FLOWERS: Greenish (may appear yellow due to abundant pollen), small and born in catkin-like spikes. Male and female flowers separate. Wind pollinated. UNARMED. The stems are without thorns, however, the leaf margins can be surprisingly sharp.